I’ve spent the last few months trying to decide where I want my blog to go from here. I do not feel drawn to become a Mommy blogger. I don’t have doctor appointments or test results to write about anymore. I sometimes do not even have time to shower daily so the thought of writing blog posts on a regular basis just seems far fetched to me. I’m still not sure where to go from here, but in the last few weeks I’ve had so many thoughts running through my head. I think this would be the best place to share those thoughts…. so here it goes. 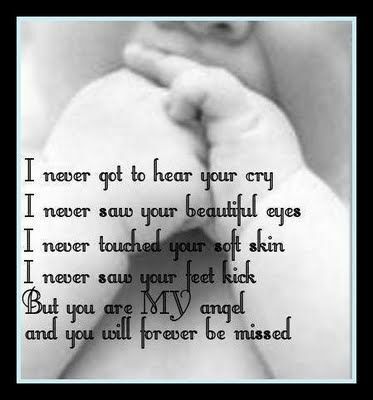 As many of you already know, today is Infant and Pregnancy Loss Awareness Day. As I scrolled through Facebook this morning while enjoying the sliver of silence in my home, I began thinking about my little babies in heaven. I wonder what they would have looked like. I wonder if they were boys or girls. I absolutely cannot wait to get my hands on them one day. I hope they know how much I wanted them here on Earth with me… I hope they know I loved them. Last week my Wednesday Night Ladies’ Class was discussing grief and how people grieve. A few of the ladies were specifically speaking about losing a spouse, parent, or grandparent. As I was listening to their words, I felt the need to share what was on my own heart. Miscarriages. The loss of a pregnancy is something so many people just do not understand. So often friends and family do not know what to say to someone grieving the loss of a pregnancy. Some do not even realize that a grieving process is necessary even for an early pregnancy loss. Just a few weeks ago I had a sweet, young woman reach out to me. She was telling me about her struggle and how she felt like everyone around her was just brushing her miscarriage under the rug. On the day she reached out to me, she shared her baby would have been due that week. She was having such a hard time. My heart ached for her because I remember that feeling of loneliness. I did my best to reassure her she was not crazy and this was a normal feeling. It is part of the grieving process. I’m so glad God gave me the words to share with this precious girl. I’m glad I was able to help her not feel alone during such an important week. So often people do not know what to say or how to act when someone loses a child early in pregnancy. We all know that. Most of us in the infertility world have been there. We have been on the receiving end of some of the things people say. Personally, even though I’ve been there I still struggle sometimes with what to say to someone. I’m guilty of NOT saying the right things or being fully present when a dear friend needed me the most after her miscarriage. I was in the middle of my whirlwind of an infertility journey, and I just didn’t have the right words or know what to do. I admit I’m not a pro when it comes to this stuff even though I’ve been on the other side of this. I am trying though. In late March of 2014 I hit my lowest point. I was grieving the loss of what we had thought was our answered prayer. I was upset. I was so raw and broken. Looking back on that post (you can find it here), I cringe. I remember trying to find a way to deal with my emotions and disappointment and coming up short. I felt so helpless. Please raise your hand if you’ve ever lost a loved one and just needed a minute to be real. [raises hand] Please raise your hand if you have ever felt your heart shatter in a million pieces at the news of a loved one dying [raises hand again]. I’m not the only one with my hand raised, am I? We are all humans here, right? I thought so. Losing a pregnancy early, later on, or giving birth to a sleeping baby is still a loss. Let me repeat that for those of you who might be wiping tears…. LOSING A BABY IS A LOSS NO MATTER WHEN IT HAPPENS. Grieving the loss is allowed. Grieving the loss is something a mother HAS TO DO. I do not personally know the pain of losing a child in the 2nd or 3rd trimester, but I have unfortunately witnessed women who have had to endure such pain. I do know the pain of losing a pregnancy early on. I know the excitement of seeing those 2 solid lines …. then a few weeks later bleeding and being told you lost your pregnancy. I know the feeling of wanting something so badly in your heart that it hurts. I know the feeling of wanting your womb to be a safe place for your child to grow so one day you might hold them in your arms. I. know. THAT. pain. On this day and every other day, I ask that you remember the Mommies who didn’t get to hold their babies and the Mommies who said hello and goodbye in the same breath. Being the Mommy of an angel is not an easy job.